Sealing your home’s deck is a wonderful maintenance initiative to ensure that your deck will always be protected from harmful elements and changing weather conditions. There are a lot of sealing products that you can use depending on the material your deck is made from. If you have no knowledge about sealing your deck, it is highly recommended that you leave the task to the able hands of the professionals. A professionally done deck sealing in Sterling Heights, MI will last for a long time and will make your deck more appealing even with the passing of time. 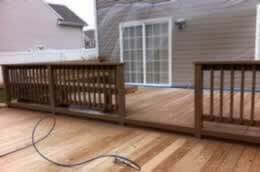 Added Protection – Deck sealing in Sterling Heights, MI ensures that your deck is protected from harmful elements. Always remember that your deck is always at war with extreme weather condition and dangerous elements. It is always best to keep them shielded. Longer Life – Sterling Heights, MI deck sealing has a big contribution in extending the life of your deck. If a sealant protects your deck, it will not be damaged easily by changing weather and harmful substances. Even mold will have a hard time penetrating the surface of your deck. Economical – Deck sealing in Sterling Heights, MI will help you save a lot of money from costly repairs and replacement.